SPORTSWOMAN OF THE YEAR/DECEMBER: Mary Hannigan talks to December’s award winner, outstanding young Dublin sailor Annalise Murphy. ANNALISE MURPHY knew it was going to be a challenging year, her first on the senior circuit. 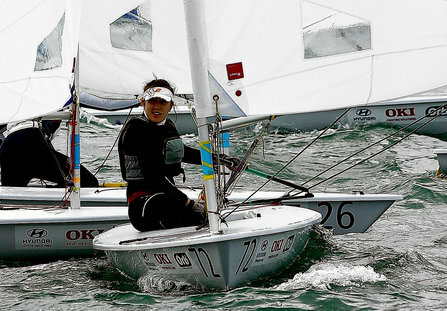 And despite a hugely encouraging 2008, the highlight being her fifth-place finish at the Laser Radial Youth World Championships, she expected the step up to be significant. It was, too. But there was a moment at the senior World Championships in Japan in August when she realised she was doing just fine. ‘I remember seeing the gold medallist from Beijing behind me, I was half thinking I should let her pass,’ she laughs. ‘But I didn’t, and ended up beating her in that race. I couldn’t believe it, really. 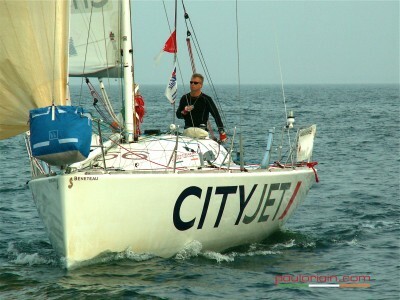 Irish Sailor Paul Ó RIAIN competed solo onboard his yacht “CityJet” in La Solitaire du Figaro in 2007, a gruelling 1,800 mile 4 stage yacht race between France, Ireland and Spain. Come and hear Paul speak about racing in the world’s most competitive solo sailing event. Hear about battling sleep deprivation when skippers cannot sleep for more than 20 minutes at a time during races. Learn how he dealt with mental fatigue & exhaustion, the difficulties, the severe storms that hit the fleet racing in the Atlantic and the mamoth task of taking on this iconic race against the best sailors in the world. 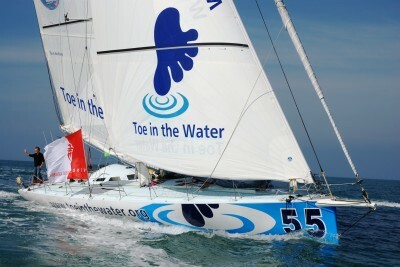 British Sailor Steve WHITE staked all to compete in the 2008-9 Vendée Globe solo round the world race. His story, of how he made it to the start of the biggest, toughest and most dramatic round the world sailing race ever and completed his remarkable circumnavigation to finish an incredible 8th place from 30 starters is both inspiring and compelling. White was a late comer to ocean racing but became hooked by every aspect of solo and short handed racing, refusing to let anything stand in the way of his dream. In the end his project went to the 11th hour but he had all the essential skills to complete the race, including 4 transatlantic races and more besides. Racing alongside many of the top professionals in the sport, White prevailed when many didn’t. Ultimately White was one of only 11 to finish and proved to be a talented solo ocean racer plus a colourful and good humoured communicator throughout. The talk will be in English with questions and answers (in French and English) including photographs & video footage and a wine reception afterwards. Small bit of snow here in Dublin, many panicked people! With snowflakes a’landing, asleep with my book. When up on the deck I heard footsteps and stuff. “I’ve been boarded!” I thought, and I need to be tough. So I figured he must be the resident drunk. And some kind of fancy electrical thingy. I just hoped he was giving and wasn’t just selling. and I went to the hatch just to spy on this wreck. Eight tiny dolphins and a beautiful sleigh. And the dude hopped aboard and prepared to make way. But the guy raised a genny and mains’l instead. “Yo Harry and Jamesie, newEd and Tony! Or Robert and Simon, Niamh and Cathy! “Yo Hickey and Franco and Seamus and Cally! Or Louis and Butler and Creighton and Suzie! “Hey Fungi and Bertie and Dustin and Nixon! Or Michael and Pat the Cope, Mason, and Dixon! But the dolphins proceeded to pull him around. With apologies to Clement Clark Moore. Or, perhaps not? 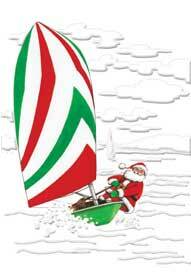 With over 85 expressions of interest and some 35 sailors of all ages gathering in the National Yacht Club, Dun Laoghaire, Dublin on Wednesday the 16th December to meet, discuss and commit to short handed yacht racing in Ireland. 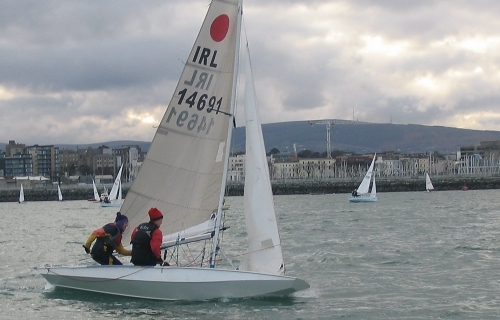 It looks like this type of sailing is going to become a prominent feature on the Irish sailing scene. The meeting began with a short video shown by Paul Ó Riain of his participation in La Solitaire du Figaro 2007 (the Figaro). This was followed by a slide show presentation given by Barry Hurley about his success in the Ostar 2009 (Original Single-handed Trans-Atlantic Race) and his experience racing on the Petit Bateau circuit, now called the “Solo Offshore Racing Club”. 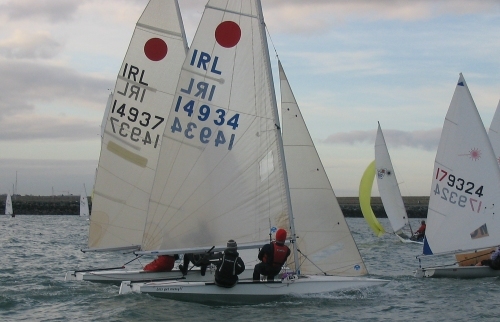 The meeting opened up to the floor where other prominent Irish short handed sailors, including Cian McCarthy, Michael Boyd and Mick Liddy outlined their experiences of Class Mini, Class Forty, Open 40, short handed IRC handicap racing and record attempts. There was huge enthusiasm from the meetings participants to see initiatives put in place to develop a circuit in Irish waters in 2010 and beyond. There was general agreement to develop things gradually and keep in line with developments internationally. It was agreed to develop a series which would cater for the existing fleet of boats which normally sail under IRC handicapping and to see if a series can be facilitated within existing events like for example ISORA (Irish Sea Offshore Racing Association). It was also agreed that it would be desirable to look at developing a one-design or box rule class long term. 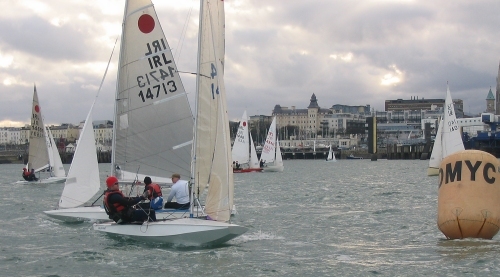 To kick this off the 10 SailFleet J80’s owned by the Irish Sailing Association have been booked for 10/11 July 2010 for a series of double handed coastal races out of the National Yacht Club, Dun Laoghaire. 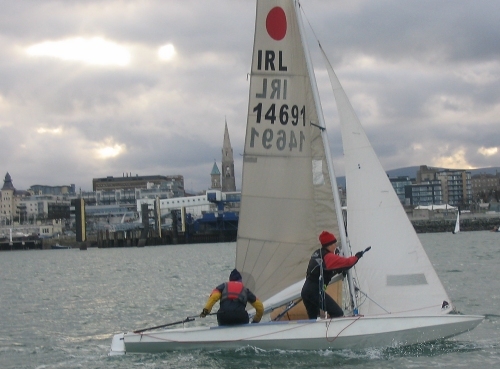 I was on Weather Mark duty during yesterday’s Frostbite race in Dun Laoghaire Harbour. Always a good place to be and I sometimes hand out I-can-repair-it business cards following a bit of argy-bargy. Here a few photos. Andy and Barry in "Let's Get Messy"
Louise and Hermine in "Goodness Gracious"
Drilling for Coal in Dublin Bay! Or, just east of the Kish Bank to be more accurate. 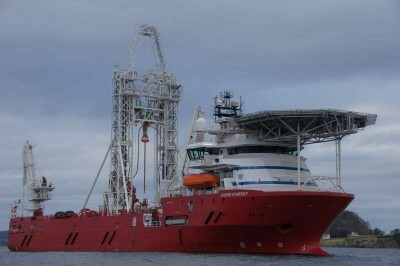 The newly built dynamically positioned drillship Fugro Synergy is due to commence drilling operations for VP Power in the Kish Basin, approximately 13.5 Nautical miles east of Bray Head on or around 7 December 2009. The wells will be shallow coal exploration drilling to a primary target in the Upper Carboniferous Westphalian B/C formation, a really old layer of rock. VP Power has contracted the Synergy to drill three exploration wells on the Kish Basin in Dublin Bay. The job is to verify the amount and quality of coal in place for a future Underground Coal Gasification (UCG) project. The deepest well will be drilled to 3,600 ft. The Kish Basin prospect, close to the lighthouse of the same name, is said to hold up to 2bn tonnes of “clean” gas-from-coal energy that could power scores of power stations for many years. VP Power, which has held an exploration license across large sections of the Kish Basin for the last two years, is led by the Dun Laoghaire marina developer Michael O’Leary (no relation to Ryanair CEO), and chairman Con Casey, managing partner of accountants LHM Casey McGrath. Clean technology, called underground coal gassification, that heats the coal in the underwater rock reservoirs to extract gas, has been proven in other parts of the world, say the investors. If the tests prove positive, will the Shell to Sea campaingers move to Dalkey? 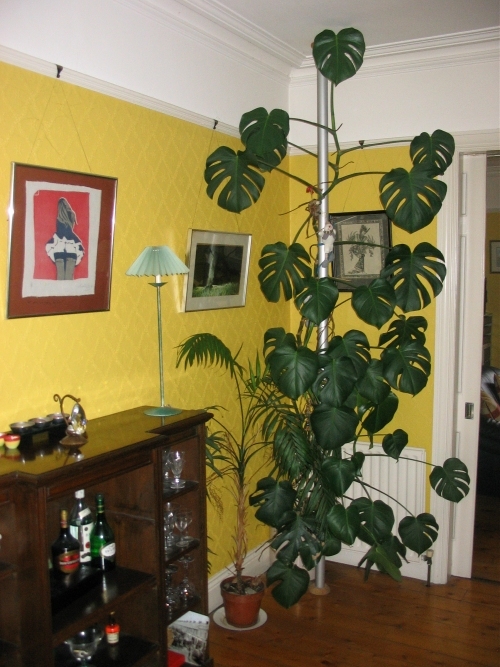 This is a Laser dinghy broken top mast serving as support for our Monstera Deliciosa, commonly known as a swiss cheese plant. It is supported top and bottom with a turned timber disc hollowed out with a hole saw. 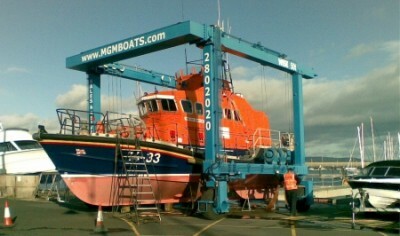 Sunny day in the Harbour and the Howth Lifeboat is on the hard for quick powerwash of her hull. Rule 18.2(c) will be changed to prohibit a newly discovered and potentially dangerous tactic that was an unintended consequence of the current wording of this rule. 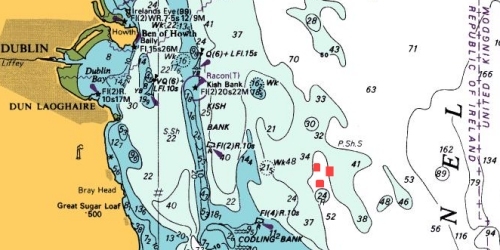 The revised rule will no longer permit a boat to tack just before she reaches a mark and, as a result of her tack, become entitled to mark-room from boats that had been clear ahead of her when they reached the zone. A parallel change in rule B3.1(c) outlaws a similar tactic in a sailboard race. 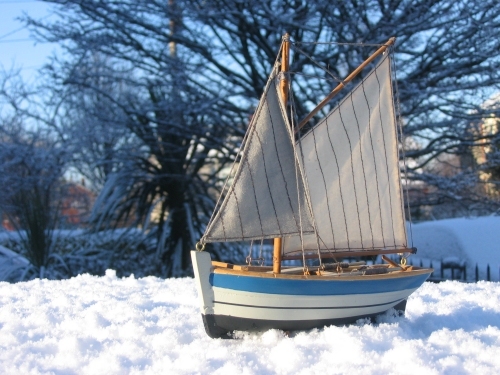 The definition Obstruction will be changed so that a boat racing will no longer be an obstruction to other boats that are required to give her room or mark-room. This change will simplify the analysis of some situations near a mark in which both rules 18 and 19 apply, and it will not otherwise change the ‘game’. Additions will be made to the definition Party to correct unintended omissions. The revised definition will mean that, whenever redress is requested for a boat by the race committee or considered for a boat by the protest committee, that boat will be a party to the resulting hearing. Also, a race committee that requests redress for a boat will also become a party when its request is heard. 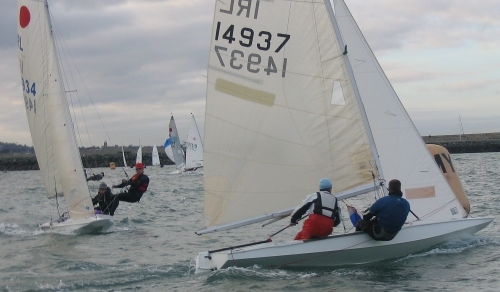 A new rule, rule C2.12, will be added to the Match Racing Rules. It will prohibit a tactic at the windward mark that the match racing community does not wish to allow. After the 2009 rulebook was printed, ISAF revised its Advertising Code and, in so doing, eliminated all references to Category A advertising. References to the Advertising Code in Appendices J, K and L will be changed to make them consistent with the revised Code.